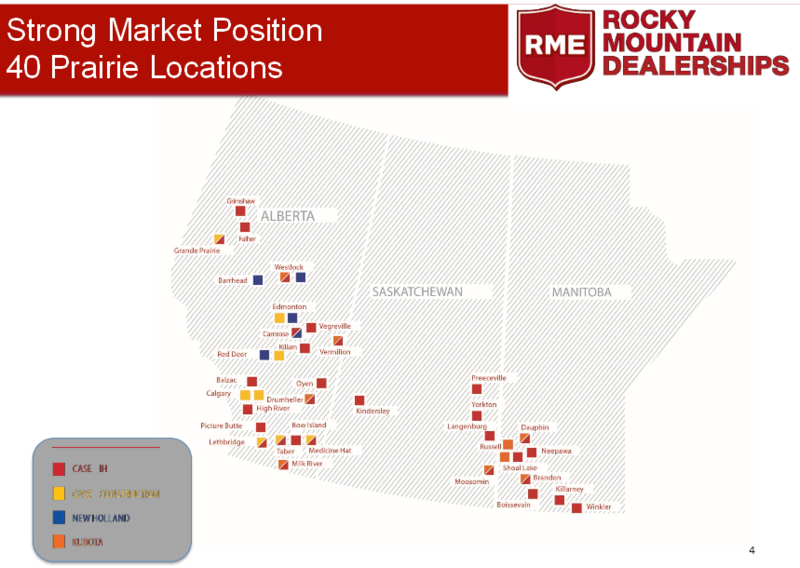 Rocky Mountain Dealerships, Inc. is a rapidly-growing, modestly valued agricultural and construction equipment dealer operating in Canada’s prairie provinces. Since 2008, the company’s first full year of public ownership, RMD has increased annual revenues at a 23% annual rate and has grown adjusted net income at the same pace. The number of company locations has grown from only 12 at the beginning of 2008 to over 40 now. RMD is a serial acquirer, focusing on rolling up smaller operations and integrating them under its Rocky Mountain Equipment brand. RMD’s dealerships sell both new and used farm equipment such as tractors and combines, and construction equipment such as the large trucks and excavators used for infrastructure, home construction and oil & gas applications. Within agriculture, RMD primarily deals Case New Holland equipment. Case New Holland manufactures the world’s second and third leading agricultural equipment brands, trailing only Deere & Co. Rocky Mountain Dealerships is the largest Case New Holland Vendor in Canada, and second worldwide. The Canadian provinces of Alberta, Manitoba and Saskatchewan where the company operates are Canada’s breadbasket, producing staggering amounts of wheat and other crops. They are also home to a well-established and growing petroleum industry. 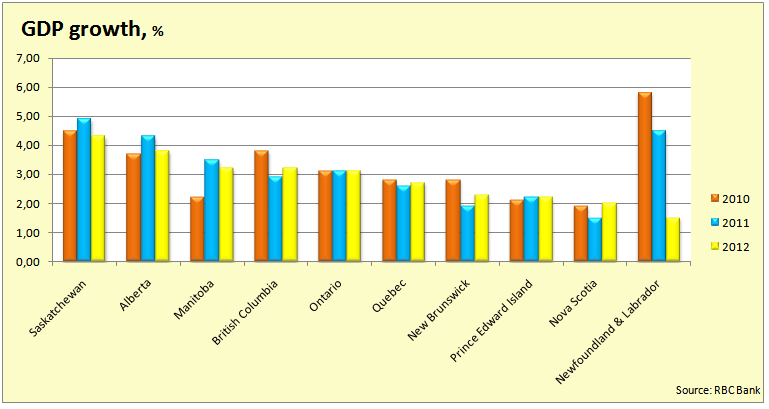 Not surprisingly in a food and energy-hungry world, these provinces have experienced GDP growth rates above those of other Canadian provinces. While healthy GDP growth within its economic territory has provided a tailwind, RMD’s greatest growth engine has been its unrelenting purchases of smaller dealerships. In 2011 and 2012 alone, RMD purchased (the dealership assets thereof or outright) Agritac Equipment, J&B Equipment, Camrose Farm Equipment and Houlder Automotive at a total cost of $21.5 million CAD. A roll-up strategy can be highly successful in a fragmented industry. Aggregating smaller dealership entities under the Rocky Mountain Equipment name provides opportunities for cost reduction through eliminating duplicate corporate functions. RMD’s stated goal is to keep SG&A costs under 10% of revenues, and the scaling strategy seems to be bearing fruit. In 2012, SG&A expense was 9.6% of revenues, compared to 11.2% in 2008. Lower inventory costs are another benefit to scale. With nearly $1 billion CAD in annual revenues, RMD can almost certainly achieve better inventory terms than small independent dealers can. In an April 2012 presentation, the company provided a map of its locations across the three provinces. Since then the company has acquired a few more. Rocky Mountain Dealerships’ results since 2008 show torrid growth achieved without sacrificing margins. Even in the midst of the 2008-2009 financial crisis, RMD kept right on growing and profiting. 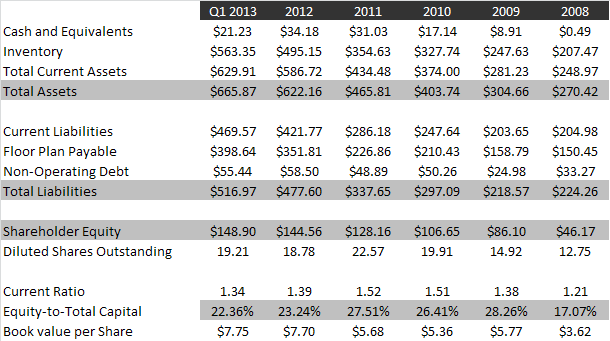 Despite its intense growth, RMD was free cash flow positive in four of the last five years. Operating income in the chart below has been adjusted for one-time items, but net income has not. Figures are in millions CAD. Despite significantly increased operating income in 2012, net income was nearly flat. This is due to a $4.2 million charge the company took related to the repurchase of all its convertible debentures. The repurchase reduced diluted shares outstanding by 17%. RMD’s impressive free cash flow in the face of such a high growth rate is partially the result of smart working capital management. Net working capital to sales reached a high of 20% in 2010, but has since been reduced to 16.4%. Smart working capital management frees up cash that can be used for acquisitions or debt reduction or any number of other actions that increase equity value. The chart below shows balance sheet figures since the company’s IPO, again in millions CAD. At first glance, RMD’s balance sheet may seem stretched. Total assets come in at 4.5 times equity. However, the picture is better than it seems. 77% of the company’s liabilities are “floor plan payables.” Floor plan payables are amounts owed on inventory the company holds. The interest rates on these payables range from 0% to prime+4.3% as of December 31, 2012. These floor plan payables are secured by the inventory only and have no recourse to the company. They come due when the inventory is sold or transferred or at 48 months maximum. Floor plan financing allows the company to take on a lot of inventory at a low cost, without tying up its own capital. Excluding the total floor plan payables figure and an equal amount of inventory, RMD’s equity-to-capital ratio rises from 22.36% to a much more comfortable 55.7%. 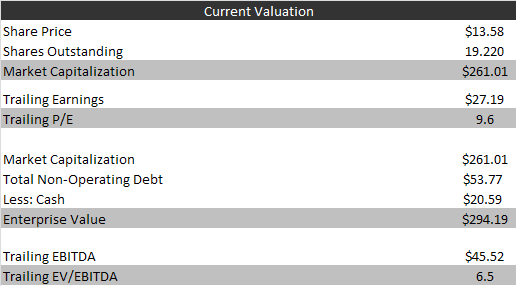 The company’s non-floor plan payables debt (what I have termed “non-operating debt”) net of cash comes in at $34.2 million CAD, or 0.7 times EBITDA. That’s a very comfortable figure, especially considering the company’s resilience even through the worst days of the financial crisis. Despite its 20+% growth rate, healthy finances and strong market position, Rocky Mountain dealerships trades at only 9.6 times earnings and an EV/EBITDA of 6.5. Amounts below are converted to USD, since I am using the ADR’s share price. Rocky Mountain also trades at a significant discount to its competitors, despite its superior growth rate. For RMD to trade at a peer average P/E ratio, shares would have to appreciate to $16.30. For a peer EV/EBITDA ratio, shares would trade up to $17.73. A peer average valuation seems conservative, given the company’s small size and attractive geographic location. RMD recently raised its annual dividend to $0.40 CAD, yielding 2.9% at current prices. Management has significant skin in the game with RMD, owning 22% of shares outstanding. This high ownership comes from RMD’s origin: Current CEO Matt Campbell and current President Derek Stimson merged their former companies and took the resulting company public as Rocky Mountain Dealerships. The surviving company does engage in ongoing related-party transactions, though these seem to be on fair terms. The biggest risks for investors in RMD are the unpredictable commodities markets and the possibility that Canada’s economy will stumble. A decline in wheat or oil prices could greatly reduce demand for expensive combines and trucks as farmers, builders and drillers delay capital expenditures and choose to use existing equipment for longer. There are rumbles that Canada’s hot housing market could come to an ugly end, but that is far from a certainty. US investors also need to be aware of currency risks. A strengthening US dollar could reduce returns for US investors. Risks aside, investors could be looking at a great growth stock at a very reasonable price in Rocky Mountain Dealerships. How many US companies offer 20% or more annual growth, yet trade at under 10 times earnings? I own shares in Rocky Mountain Dealerships. RMD looks like a good value. I bought a small position after doing further research. The only reason that I didn’t buy a bigger position is that I like URI better and have a position there. Have you looked at URI at all? I’d be more concerned about the floor plan payables than you are. We have been in a declining rate environment for the past 10 years. What happens when rates rise? What happens to their margins? The rates the company pays on floor plan could rise with general rates, but I’m more concerned that the flow of credit could be reduced if the economy faltered. In 2008, the company noted that it had not experienced a reduction in available credit, but that effective rates had gone higher. There’s no guarantee the company would sail through again. 1. Though there finances appear adequate, I don’t understand why they insist on paying a dividend while the company is on an acquisition binge. 2. Recently, the head of the Board’s comp committee (Keith E. Macdonald) was basically removed due to 53% of the votes being withheld. Was not able to find what the origination of the conflict was, but of the other 5 directors up for election…all had >99% approval. Really not sure what to make of it….. perhaps the CEO (Campbell) was not happy with him. I have not done much with Canadian stocks, but it appears their reporting on SEDAR is at least as good if not better than the SEC fillings. Thanks for the report. I have only begun to look seriously at Canadian stocks, but I’ve found their quality of disclosure to be excellent. Paying a dividend seems to be even more highly regarded in Canada than it is in the US; I’ve seen many companies that are barely earnings or cash flow positive or are growing quickly that still pay a dividend. Not sure why MacDonald is out. I was wondering if he were involved in some shady deals in his personal life or whatnot, but I can’t find a single headline. Your guess of a difference with Campbell seems like as good a theory as any. Big sell off after 2Q earnings release seems like an overreaction. Numbers didn’t seem THAT bad to me. I am tempted to initiate a long position now. My thoughts as well. I listened to the conference call today. They talked about proactively reducing inventory, which will help them maintain gross margin if the slowdown continues. They also remarked how their competitors aren’t doing that and will eventually have to pay the piper. Also mentioned the weakness in agricultural machines was mostly due to weather and uncertainty among customers. They said the issues within construction machines were more internal and they are adjusting in response. Management projected strong free cash flow for the remainder of the year and said it is not currently evaluating any acquisition targets. They also want to get costs under control and reduce SG&A to under 10% of sales. I think the sell-off was way overdone. Thanks for the good link. I think fears of a slowdown in agriculture are a big reason why RMD trades at such a low valuation. I am not terribly concerned, mostly because I have a lot of respect for management. They built the company from the ground up, and they’ve been through several cycles before. If the cycle does turn, I expect they’ll manage working capital efficiently and generate free cash flow. Maybe they’ll even purchase smaller competitors opportunistically.